The encoded data size depends on the type and the length od the data to data to code. 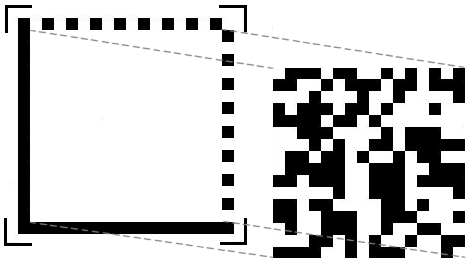 An intermediate structure of 8 bits is used to save each data: the codeword. Correction codewords: Based on data and stuffing codewords, it's a Reed-Solomon checksum which allows to retrieve each part of the data in case of reading error. Low level encoding: consists to position these codewords in the data matrix. A symbol is composed of black and white rectangular patterns called "cells" or "modules". 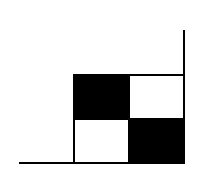 A module represent a bit: usually black for the "1" and white for the "0". 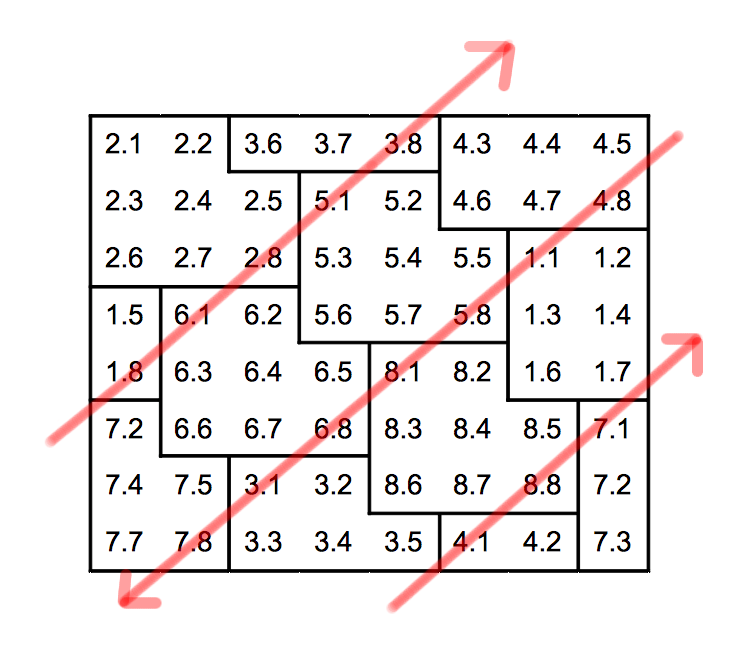 The DATA MATRIX can be a square (mostly used) or rectangular. The data matrix which is composed of modules in the form of a matrix and which is in the center of the tracking units. 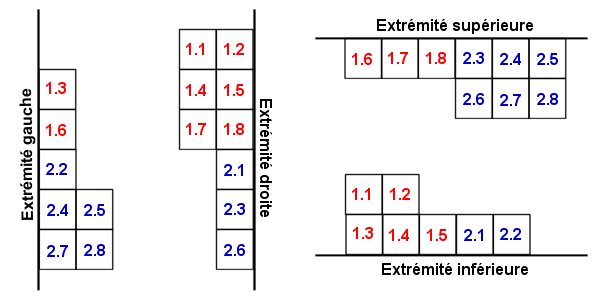 When the symbol exceeds a certain size limit, the symbol is divided into data areas, regions, which are defined by internal locating designs. 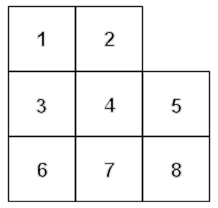 Four types of division into regions exist: 3 for square and 1 rectangular shape. 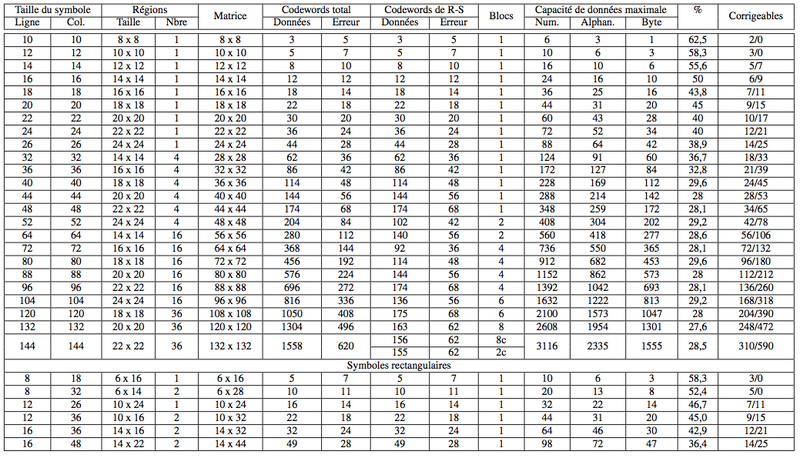 Six encoding modes coexist: ASCII, Text, C40, X12, EDIFACT and Base 256. The ASCII encoding is the default encoding and the most used. It will be presented here only. Some of the values will not be explained because not used in the ASCII explanation. The value of a non-extended ASCII codeword (from 0 to 127) equals "ASCII value + 1"
The value of a non-extended ASCII codeword (from 128 to 255) is encoded with 2 codewords: the first, called Upper Shift, equals "235" and the second equals "ASCII value - 127"
Numbers are encoding in a single codeword by group of 2 figures which is equals to "Numeric value + 130". The Reed-Solomon codes are used as error correction system. They have a capacity of detection and correction of errors defined in advance, depending on the size of the data matrix. A body C is a set of elements provided with two closed and called binary operations addition and multiplication. Being closed means that the result of each operation on two elements of the assembly will always be an element of the assembly. There are many bodies, finite and infinite. It turns out that for any integer prime p and any integer n (>=1), there exists a unique finite np elements, noted GF(np). These bodies are called Galois fields. 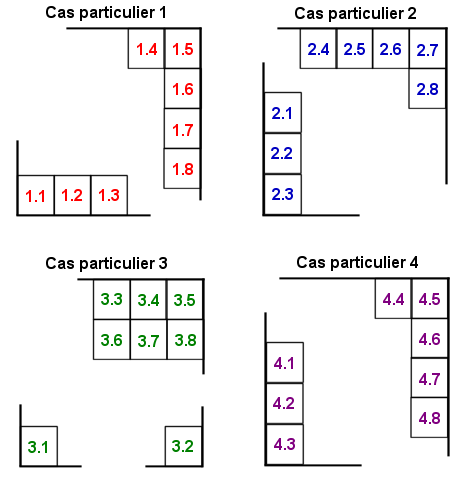 For each Galois field, there is at least one primitive polynomial, denoted by p (x), which allows to build the body. Data Matrix storing data of 8 bits (in codewords), and therefore work in the Galois field GF(28). They use the primitive polynomial x8+x5+x3+x2+1, which corresponds to the value 301. A Reed-Solomon code of length n with k data is noted RS(n,k). So there is n-k = 2t check symbols and this code can correct up to t erroneous symbols. The number of control symbols is defined by the size of the Data Matrix. Once the generator polynomial calculated, we simply follow the equation to obtain the control polynomial: it is the rest of the division between the data polynomial and the generator polynomial. 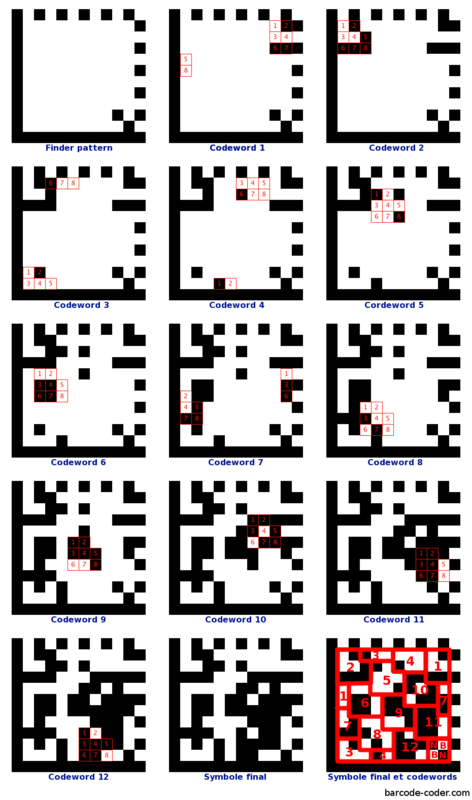 Coefficients correspond to codewords control. 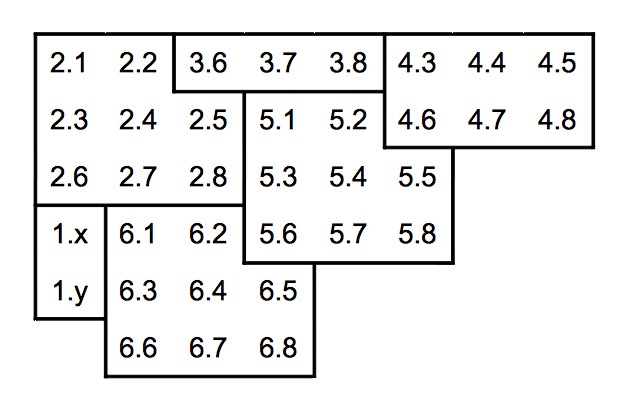 Each codeword is represented in the data matrix by a square part of 8 modules, corresponding to 8 bits. Module 1 has the value of the most significant bit (value 128), while the module 8 has the value of the most insignificant bit (value 1). It is however possible that a codeword can not be contained entirely within the matrix at a certain location. These can then be separated into parts (2 or 3) to be continued on the other side of the symbol. In addition, in four cases, the codewords placed in the corners can also be placed differently. The codewords are then nested in the other, following the oblique lines (45 °) in parallel. The meaning is identical slashes half the time. It will then add the finder pattern and possibly the main internal finder pattern if the number of regions is greater than 1. The value of codewords 1, 2 and 3 were calculated simply by using the "ASCII value + 1", while the codeword 4 encodes two digits using "130 + numeric value." It has four codewords to encode, therefore we choose the minimum size of the symbol to encode: it is the symbol of size 12x12, offering a data matrix of size 10x10 and 12 codewords to encode compounds 5 codewords and data correction codewords 7. Knowing that 5 codewords data are needed and that we do not have that 4, a codeword filling will be added: it is the codeword value "129", which is always the first to indicate the end of data. It is not necessary to calculate other using the 253-state algorithm. the polynomial i(x) xn-k = 70 x11 + 79 x10 + 68 x9 + 131 x8 + 129 x7.